Department of Biochemistry, Mount Carmel College, Autonomous, Bengaluru - 560052, Karnataka, India. ABSTRACT: Hypercholesterolemia is one of the major conditions that are prevalent in today’s world, the significant causes being unhealthy food habits and lifestyle or abnormal genetic conditions. HMG CoA reductase is an important rate-limiting enzyme in the mevalonate pathway that synthesizes cholesterol. Biosynthesis of cholesterol in the liver can be reduced significantly by inhibiting HMG CoA reductase. Statins are the drugs used for the treatment of hypercholesterolemia. Due to the undesirable effects caused by synthetic statins, there is a need for the development of natural HMG CoA reductase inhibitors that are of plant origin. This study aimed to investigate the anti-inflammatory and HMG CoA reductase inhibitory effects of different hydro alcoholic plant extracts on the enzyme HMG CoA reductase activity obtained from Gallus gallus domesticus liver. Our study showed that the hydroalcoholic extract of Rosa centifolia exhibited the maximum inhibition of the enzyme under analysis with a ratio of 1.4117 and hence was subjected to solvent-solvent partition for the partial isolation of the inhibitory compounds. The result of this study suggests that Rosa centifolia extract has potential antihypercholesterolemic activity. INTRODUCTION: Hypercholesterolemia is a condition characterized by elevated cholesterol levels in the blood of animals caused by various factors that are environmental or genetic 1. The optimum concentration of serum cholesterol is less than 200 mg/dL in humans. Serum cholesterol levels greater than the optimum leads to hypercholesterolemia and in turn causes heart associated diseases 2. Cholesterol is insoluble in water is transported within small protein particles as lipoproteins such as low density and high-density lipoproteins. Elevated levels of low-density lipoprotein cause hypercholesterolemia, as the main component of LDL is cholesterol. The risk of stroke due to hypercholesterolemia can be reduced by about 29% by decreasing the activity of HMGCR which in turn reduces the cholesterol levels in the blood 3, 4. HMG CoA reductase is a rate-limiting enzyme in the mevalonate pathway of cholesterol biosynthesis in humans catalyzing the conversion of 3-hydroxy-3-methylglutaryl CoA (HMG CoA) to mevalonate. HMG CoA reductase can be categorized into two classes: Class 1, found in eukaryotes and Class 2, found in prokaryotes 5. Transcription and translation of the enzyme are said to increase when the levels of the mevalonate pathway products are quite low in the blood 6. The enzyme can also be regulated by phosphorylation that is achieved by protein kinases that are AMP-activated, thereby reducing the HMG CoA reductase activity 7, 8. Statins are drugs that can reduce the lipid levels in the blood 9. They inhibit HMG CoA reductase activity thereby preventing the formation of mevalonate from HMG CoA by acting as competitive inhibitors 10, 11. Statins have an HMG like a moiety due to which they bind competitively to HMG CoA reductase at the active site, inhibiting it 12. In considerable cancer cell types, the inhibition of HMG CoA reductase leads to the arrest of cell growth and hence the death of the cell 13, 14. Rosa species have been reportedly used in aromatherapy to reduce the post operative pain in children 15. The oil of Rosa centifolia has been reported to have antiseptic, aphrodisiac, astringent, anti-arthritic and anti-mutagenic properties 16, 17, 18. A recent study has also highlighted the analgesic and anti-anxiety effects of rose oil in humans 19. Coriander is a common herb that is known for its aromatic seeds and foliage. It is native to Europe and the Mediterranean region. The sample has also been reported to possess antibacterial and antifungal properties against selected micro-organisms like Bacillus subtilis, Staphylococcus aureus, Salmonella typhi, and Candida species 20. Recent studies have also demonstrated the anti granuloma property of the herb 21. Cynodon dactylon mostly known by common names Bermuda grass, Bahama grass, durva grass, etc., is a grass native to the Middle East. The Bermuda grass is used for gastrointestinal disorders, kidney problems, and urinary infections and also as a blood purifier 22. The plant sample is also used for treating syphilis, piles, and dropsy and wound infections. It is used as an ethnomedicine to carbuncles, hypertension, and gout 23, 24. From the ethnopharmacological point of view, the plant is used in the management of wounds and is used as hemostatic agent 25. According to a study by WHO, a significantly high percentage of the population in developing countries is dependent on traditional medicine as their primary health care 26. Rosa centifolia, Coriandrum sativum, and Cynodon dactylon were chosen for this work owing to the increasing demand for herbal products. This study focuses on the anti-hypercholesterolemic activity of the plant samples and also compares their anti-inflammatory effects. Preparation of Sample Extract: The plant samples Rosa centifolia, Coriandrum sativum, and Cynodon dactylon were procured from K.R. market in Bengaluru by random selection. The samples were washed clean with distilled water and air dried. The 5% raw extracts of the plant samples were prepared by homogenizing the petals of Rosa centifolia, stems of Coriandrum sativum and leaves of Cynodon dactylon with distilled water, 50% methyl alcohol and chloroform separately using mortar and pestle. The crude extracts were filtered and centrifuged at high speed for 10 min and stored at 4 ºC in an airtight container for further use. Chemicals: The chemicals used were arsenate, bovine serum albumin, ferric chloride reagent, hydroxylammonium chloride, perchloric acid, phosphate buffer saline, sodium citrate, and sodium dodecyl sulphate. Equipment: The types of equipment used were UV-visible spectrophotometer, weighing balance, cooling centrifuge and UV transilluminator. Liver Tissue Source: The chicken liver was obtained from Karnataka Chicken Centre in Vasanthnagar, Bangalore. The chicken liver was cut into pieces of required weight after washing it with 0.9% saline. Where, Abs control = O. D of BSA without the sample, Abs sample = O. D of BSA with the sample. In-vitro Anti-haemolytic Assay: The procedure of anti-hemolytic assay was carried out according to the method described by Henkelman et al., 28 using hydro-alcoholic sample extracts. Blood from healthy volunteers was collected into centrifuge tubes containing 3.2% of sodium citrate which was used as an anticoagulant. In-vitro HMG CoA Reductase Enzyme Activity Assay: The HMG CoA reductase enzyme activity was determined according to the procedure described by Venugopala Rao and Ramakrishnan 29. The hydroalcoholic extracts were found to have a high amount of phytochemicals that were determined previously and hence were chosen to determine the HMG CoA reductase activity. The procedure was carried out using chicken liver. About 100 mg of chicken liver tissue was treated with 1 ml of 1g/L arsenate solution and homogenized well in a mortar and pestle. 0.5 ml of this tissue homogenate was mixed well with the same volume of 50 ml/L diluted perchloric acid and centrifuged at 3200 rpm for 10 min at 4 ºC after an incubation period of 5 min. The mixture was filtered, and 0.5 ml volume of it was treated with 0.5 ml of freshly prepared hydroxylammonium chloride pH 5.5 of 2 mol/L concentration for the determination of HMG CoA and another reaction mixture with pH 2.1 for mevalonate. After an incubation period of 5 min, 0.2 ml of the hydroalcoholic sample extracts were added to the respective tubes and was incubated for 20 min. After the incubation, 1.5 ml of ferric chloride reagent was added to the solutions for both HMG CoA and mevalonate and mixed well. The absorbance was taken after incubating the test tubes for 10 minutes at 540 nm spectrophotometrically. 1g/L of arsenate solution treated similarly was used as a blank. The ratio of HMG CoA to mevalonate was taken as an index to the enzyme activity. A higher ratio indicates a lesser enzyme activity and vice versa. The samples showing lower enzyme activity were considered for further tests. Solvent-solvent Partition: The process was performed according to the protocol of Rahman et al., 30 with a few modifications. Three different solvents- hexane, ethyl acetate, and chloroform were used for the process. Equal volumes of hydroalcoholic extract of Rosa centifolia and hexane were mixed vigorously for 5 min and allowed to stand till the organic phase separated and was collected. The sample treated with the solvent was centrifuged at high speed for 8 min to enable the residual solvent to separate and the fraction of interest was collected. The sample was treated similarly with ethyl-acetate and chloroform, and the separating organic phases were collected and subjected to HMG CoA reductase enzyme activity assay. The extracts showing minimum enzyme activity was selected for further study. 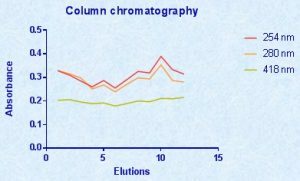 Column Chromatography: The Rosa centifolia hexane extract was subjected to column chromatography for partial purification of the sample. Silica gel was used as the stationary phase and 70% ethyl alcohol was used as the mobile phase. 1 ml of the sample was injected into the column, and the flow rate was adjusted to 0.2 mL per min. 1 ml of the elution was collected in vials, and the optical density was determined at 254 nm, 280 nm, and 418 nm to determine different compounds present in the sample. Comparison of Anti-inflammatory Effects of the Sample Extracts: Protein denaturation is one of the well-known causes of inflammation. Proteins upon denaturation lose their secondary and tertiary structure on account of external stress such as varied acid, base or salt concentration, heat, etc. Protein denaturation in eukaryotes is carried out by a process called ubiquitination mediated by the 76 amino acid long polypeptide ubiquitin 31. The comparative anti-inflammatory effects of the sample extracts were calculated and plotted as seen in Fig. 1. It was observed that the hydroalcoholic extract of Coriandrum sativum showed the highest value for the inhibition of protein denaturation (95.83%), thus explaining the potent anti-inflammatory activity of Coriandrum sativum, followed by that of R. centifolia and C. dactylon. However, the less anti-inflammatory effect was observed in the aqueous extract of Cynodon dactylon (25%). Aspirin that was used as the standard drug for the anti-inflammatory action showed 64.18% protein denaturation inhibition at 0.1 mg/mL concentration and 68.56% inhibition at concentration 1.0 mg/mL against control. Non-steroidal anti-inflammatory drugs manage inflammation by the prevention of formation of prostaglandins via restricting the activity of cyclooxygenase enzyme (COX) 32, 33. Aspirin is an example of a non-steroidal anti-inflammatory drug. Though NSAIDs have been attested of their antipyretic, analgesic, and anti-inflammatory actions they are also known to have side effects such as peptic ulcerations, intra-mucosal bleeding, etc. 34 This raises the need of use of a natural compound as a drug that can have anti-inflammatory property and not have any side effects. Coriandrum sativum is reported to have been used in the treatment of bed cold, nausea, stomach disorders and also used as carminative and diuretics. Coriander plant products are used in every household. Hence incorporation of coriander stems as a part of treatments to prevent inflammation due to the action of other drugs can be helpful as also initial researches suggest the use of coriander for treatment as well as for the prevention of many chronic diseases. Comparison of the anti-hemolytic activity of the hydroalcoholic sample extracts: Most plant samples contain substances that have a hemolytic effect on human erythrocytes which results in other adverse effects. Hence, the need arises to analyze the sample for its hemolytic activity 35. 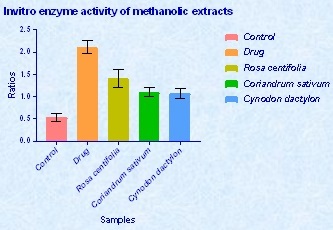 The results of the anti-hemolytic assay conducted on the hydroalcoholic sample extracts as depicted in Fig. 2 implied that the samples have appreciable anti-hemolytic activity with Rosa centifolia sample being the most potent, followed by Cynodon dactylon and Coriandrum sativum. This indicates that the various phytochemicals present in the samples quenched the H2O2 before it could attack the erythrocytes and thus prevented hemolysis 36. Comparative Study of the Inhibition of HMG CoA Reductase by the Hydroalcoholic Sample Extracts: The enzyme assay showed that the drug Atorvastatin (1 mg/mL) increased the HMG CoA/ mevalonate ratios (2.109) indicating reduced HMG CoA reductase activity. The HMG Co A Reduction inhibition by the drug Atorvastatin is by the inhibition of MYC phosphorylation and its activation. This result of a study conducted establishes that the enzyme HMG CoA reductase also acts as a critical regulator of MYC activator and is thus effective against the MYC-induced cancers 37. The control with the lowest HMG CoA/ mevalonate ratio (0.70) indicates the HMG CoA reductase activity to be high implying the uninhibited enzyme and high biosynthesized cholesterol levels. The result of the study plotted in Fig. 3 revealed that the enzyme HMG CoA reductase is inhibited significantly by all the three hydroalcoholic sample extracts with Rosa centifolia having the maximum inhibitory activity (ratio=1.4117) in comparison with Coriandrum sativum (ratio=1.099) and Cynodon dactylon (ratio=1.0684) extracts. The HMG CoA reductase inhibition might be due to the presence of sterols or isoprenoids in the plants such as the gibberellic acid sprayed on peas 38. FIG. 3: IN-VITRO HMG COA REDUCTASE ACTIVITY IN THE PRESENCE IF HYDROALCOHOLIC EXTRACTS. The experiment was performed in triplicates and the results expressed in mean ratios ± SD. Comparison of HMG CoA Reductase Enzyme Activity in Different Solvent Fractions of Rosa centifolia Hydroalcoholic Extract: The solvent-solvent extraction was carried out using three solvents: hexane, ethyl acetate, and chloroform with the hydroalcoholic extract of Rosa centifolia. The enzyme activity assay was performed and plotted as seen in Table 1. Out of the three fractions, the hexane fraction showed the highest HMG CoA/mevalonate ratio. It can be deduced from this result that the potential inhibitor of the HMG CoA reductase enzyme is present in the hexane fraction. The drug Atorvastatin at 1 mg/mL concentration showed significant inhibition of the enzyme HMG CoA reductase (ratio= 2.01). The experiment was performed in triplicates, and the values are represented as the mean of ratios. Partial Purification and Spectrophotometric Analysis of Partially Purified Rosa centifolia Hexane Fraction: The sample hexane fraction subjected to column chromatography was eluted using 70% ethanol as the eluent and silica gel as the matrix. Flavonoids, proteins, and alkaloids are reported to be determined at 254 nm, 280 nm and 418 nm respectively. The elutions were screened only for the presence of proteins, total alkaloids and flavonoids at their respective wavelengths spectrophotometrically. It was observed that flavonoids were found in abundance at the 10th elution. Total alkaloids were found to be eluted in increasing amounts after the 12th elution. CONCLUSION: This study focussed on replacing the synthetic statins with the natural, plant products to reduce or avert the toxicities of the synthetic ones. The outcome of the work is that the extracts of Rosa centifolia have potent anti-hyper-cholesterolemic activity. ACKNOWLEDGEMENT: The authors wish to acknowledge the Department of Biochemistry and the management of Mount Carmel College, Autonomous, Bengaluru for their guidance and providing facilities to carry out this project. We would also like to express our sincere gratitude to Mr. Cletus J. M. D’Souza for his valuable suggestions in enhancing this work. Olaiya C and Omolekan T: Antihypercholesterolemic activity of ethanolic extract of Buchholzia coriacea in rats. African Health Sciences 2014; 13(4): 1084-1090. Venkadeswaran K, Muralidharan AR and Annadurai T: Antihypercholesterolemic and antioxidative potential of an extract of the plant, Piper betle, and its active constituent, eugenol, in Triton WR-1339-induced hypercholes-terolemia in experimental rats. Evidence-Based Comple-mentary and Alternative Medicine 2014; 2014: 1-11. Hebert PR, Gaziano JM, Chan KS and Hennekens CH: Cholesterol lowering with statin drugs, the risk of stroke, and total mortality. Journal of American Medical Association 1997; 278 (4): 313-321. Alpérovitch A, Kurth T and Bertrand M: Lipid-lowering drugs may lower the risk of stroke in elderly people. The Pharmaceutical Journal 2015; 350. Bochar DA, Stauffacher CV and Rodwell VW: Sequence comparisons reveal two classes of 3-Hydroxy-3-methyl glutaryl coenzyme-A reductase. Molecular Genetics and Metabolism 1999; 66(2): 122-127. Nakanishi M, Goldstein JL and Brown MS: Multivalent control of 3-hydroxy-3-methylglutaryl coenzyme-A reductase. Mevalonate-derived product inhibits translation of mRNA and accelerates degradation of the enzyme. Journal of Biological Chemistry 1988; 263(18): 8929-8937. Omkumar RV, Darnay BG and Rodwell VW: Modulation of Syrian hamster 3-hydroxy-3-methylglutaryl-CoA reductase activity by phosphorylation. Role of serine 871. Journal of Biological Chemistry 1994; 269(9): 6810-6814. Han JS, Sung JH and Lee SK: Inhibition of cholesterol synthesis in HepG2 Cells by GINST-Decreasing HMG-CoA reductase expression via AMP-activated protein kinase. Journal of Food Science 2017; 82(11): 2700-2705. Gotto AM: Results of recent large cholesterol-lowering trials and implications for clinical management. The American Journal of Cardiology 1997; 79(12): 1663-1666. Brown MS, Fraust JR, Goldstein JL, Kaneko I and Endo A: Induction of 3-hydroxy-3-methylglutaryl coenzyme A reductase activity in human fibroblasts incubated with compactin (ML-236B), a competitive inhibitor of the reductase. Journal of Biological Chemistry 1978; 253(4): 1121-1128. Silva VBD, Taft CA and Silva CHTP: Use of virtual screening, flexible docking, and molecular interaction fields to design novel HMG-CoA Reductase inhibitors for the treatment of hypercholesterolemia. The Journal of Physical Chemistry A 2008; 112(10): 2007-2011. Corsini A, Maggi FM and Catapano AL: Pharmacology of competitive inhibitors of HMG-Co reductase. Pharmacological Research 1995; 31(1): 9-27. Lee SJ, Ha MJ and Lee J: Inhibition of the 3-Hydroxy-3-methylglutaryl-coenzyme A reductase pathway induces p53-independent transcriptional regulation of p21WAF1/ CIP1 in human prostate carcinoma cells. Journal of Biological Chemistry 1998; 273(17): 10618-10623. Caruso MG, Notarnicola M, Santillo M, Cavallini A and Leo AD: Enhanced 3 –hydroxy -3 –methyl -glutaryl coenzyme A reductase activity in human colorectal cancer not expressing low-density lipoprotein receptor. Anticancer Research 1999; 19: 451-454. Marofi M, Sirousfard M, Moeini M and Ghanadi A: Evaluation of the effect of aromatherapy with Rosa damascena on postoperative pain intensity in hospitalized children in selected hospitals affiliated to Isfahan University of Medical Sciences in 2013: A randomized clinical trial. Iranian Journal of Nursing and Midwifery Research 2015; 20(2): 247-254. Singh S, Kumar R, Nair V and Gupta Y: In-vivo antiarthritic activity of Rosa centifolia flower extract. AYU (An International Quarterly Journal of Research in Ayurveda) 2015; 36(3): 341-345. Kumar S, Gautam S and Sharma A: Identification of antimutagenic properties of anthocyanins and other polyphenols from Rose (Rosa centifolia) petals and tea. Journal of Food Science 2013; 78(6): H948-H954. Allardice P: The art of aromatherapy. Random House Value Publishing; New York, 1994. Mohebitabar S, Shirazi M, Bioos S, Rahimi R, and Malekshahi F and Nejatbakhsh F: Therapeutic efficacy of rose oil: A comprehensive review of clinical evidence. Avicenna Journal of Phytomedicine 2017; 7(3): 206-213. Freires IDA, Murata RM and Furletti VF: Coriandrum sativum (Coriander) essential oil: Antifungal activity and mode of action on Candida spp., and molecular targets affected in human whole-genome expression. PLoS One 2014; 9(6): e99086. Singh S, Gupta Y and Nair V: Anti-granuloma activity of Coriandrum sativum in experimental models. Journal of Ayurveda and Integrative Medicine 2013; 4(1):13-18. Kirtikar KR and Basu BD: Indian medicinal plants. Sri Sat Guru Publications, Delhi, Edition 3rd, Vol. 8, 2001. Vaidyaratnam PSV: Arya Vaidya Sala, Kottakkal, Orient Longham, Chennai, Vol. 2, 2003: 289. Biswas TK, Pandit S, Chakrabarti S, Banerjee S, Poyra N and Seal T: Evaluation of Cynodon dactylon for wound healing activity. Journal of Ethnopharmacology 2017; 197: 128-137. Jäger A, Saaby L, Kudsk D, Witt K and Mølgaard P: Short communication: Influence of pasteurization on the active compounds in medicinal plants to be used in dairy products. Jou of Dairy Science 2010; 93(6): 2351-2353. Mizushima Y and Kobayashi M: Interaction of anti-inflammatory drugs with serum proteins, especially with some biologically active proteins. Journal of Pharmacy and Pharmacology 1968; 20(3): 169-173. Henkelman S, Rakhorst G, Blanton J and Oeveren WV: Standardization of incubation conditions for hemolysis testing of biomaterials. Materials Science and Engineering: C. 2009; 29(5): 1650-1654. Venugopala Rao A and Ramakrishnan S: Indirect assessment of hydroxymethylglutaryl-CoA reductase (NADPH). Clinical Chemistry 1975; 21: 1523-1525. Rahman MA, Abdullah N and Aminudin N: Inhibitory effect on in-vitro LDL oxidation and HMG Co-A reductase activity of the Liquid-Liquid Partitioned Fractions of Hericium erinaceus (Bull.) Persoon (Lion’s Mane Mushroom). BioMed Research International 2014; 2014: 1-9.
Cooper GM: Protein degradation. The Cell: A molecular approach. Sinauer Associates, Sunderland, MA, Edition 2nd, 2000. Vane JR and Botting RM: Anti-inflammatory drugs and their mechanism of action. Inflammation Research 1998; 47(S-2): S78-87. Osafo N, Agyare C, Obiri DD and Antwi AO: Mechanism of action of nonsteroidal anti-inflammatory drugs. Nonsteroidal Anti-Inflammatory Drugs 2017; 1-15. Adebayo D: Is non-steroidal anti-inflammatory drug (NSAID) enteropathy clinically more important than NSAID gastropathy? Postgraduate Medical Journal 2006; 82(965):186-191. Saisha V, Devyani S, Rao SR and Shyamala N: In-vitro evaluation of hemolytic activity and cell viability assay of hexanoic extracts of Bridella ferruginea benth. World Journal of Pharmacy and Pharmaceutical Sciences 2015; 4(7): 1263-1268. Costa RM, Magalhães AS and Pereira JA: Evaluation of free radical-scavenging and antihemolytic activities of quince (Cydonia oblonga) leaf: A comparative study with green tea (Camellia sinensis). Food and Chemical Toxicology 2009; 47(4): 860-865. Cao Z, Fan-Minogue H and Bellovin DI: MYC phosphorylation, activation, and tumorigenic potential in hepatocellular carcinoma are regulated by HMG-CoA reductase. Cancer Research 2011; 71(6): 2286-2297. Russell DW and Davidson H: Regulation of cytosolic HMG-CoA reductase activity in pea seedlings: Contrasting responses to different hormones, and hormone-product interaction, suggest hormonal modulation of activity. Biochemical and Biophysical Research Communications 1982; 104(4): 1537-1543. Thilagavathy A, Dsouza S, Shriraksha A and Singh KG: Anti-inflammatory and antihypercholesterolemic activity of Rosa centifolia, Coriandrum sativum and Cynodon dactylon. Int J Pharm Sci & Res 2019; 10(2): 966-72. doi: 10.13040/IJPSR.0975-8232.10(2).966-72.